She is the most infamous of Henry VIII’s wives and as such, requires an equivalent nail polish. 'Anne' by Rescue Beauty Lounge: As rich and bewitching as Henry VIII's second wife. Originally from the ‘The Real Tudor Housewives’ collection, brilliantly concieved and brought to fruition by Ji Baek’s Rescue Beauty Lounge luxury brand, Anne is an olive frost finish with pink shimmers. Ji describes this polish as, “Rumored to be a sorceress, Henry’s second wife lends her short-lived name to this bewitching olive green with a pink-gold metallic iridescence.” Another dimension to this polish is that it gives off a complex ‘brocade’ effect in low light and a rich shimmer effect in outdoor light. The closer you look, the more interesting the shade becomes. Truly a seductress. As is my experience with most of the RBL polishes, this goes on smoothly, is opaque in one coat and there is very little difference between how the color looks in the bottle and how it looks on my nails. Even after a week with intense 120 wpm typing, I get minimal tip wear and absolutely no incidental chipping (knocking my nails against the microwave doesn’t count). The best presentation of Anne is to use it with a high-end glossy topcoat like RBL’s own brand or MAC Overlacquer. I do NOT recommend using Seche Vite to quick-dry RBL polishes. Dont 'cha wish your nail polish color was hawt like me? If you are one who does not like to blend in but make an elegant statement when you stand out, this polish is an excellent candidate for you. 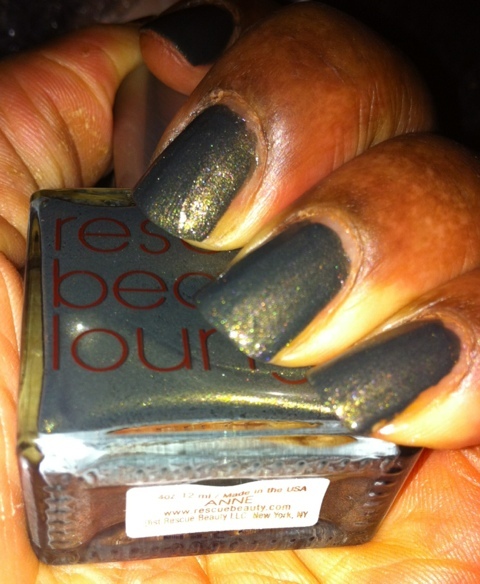 Because of the intense pigmentation, this polish looks amazing on women of color. With the balance of pink iridescence against olive I feel this color will work with both cool and warm skintones. For reference in the swatches, I have a very cool skintone with red undertones. 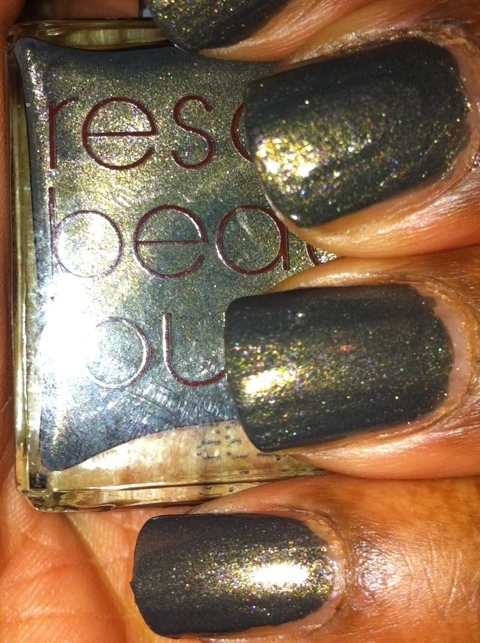 RBL polishes retail for $18 a bottle , are ‘Five Free’ and are available only at RescueBeauty.com. As Anne is a limited edition, once the supply is gone, it’s gone. My suggestion is to haul this as much as your wallet will allow. Ji graciously gives free shipping to all US orders over $100 USD and International orders over $200 USD.